Woodside Fencing conducted an Epee Clinic which was presented by Christian Fach of Friedrichshafen, Germany. The first day all the coaches came eager to learn the importance of the German system. Fencing distance, the four basic tempos and timing were discussed. The coaches had the opportunity to practice with each other and get additional lessons from Coach Fach. 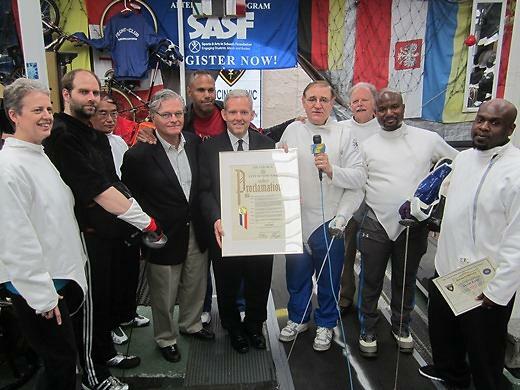 Proclamation to Woodside Fencing for all the work that is being done to teach inner-city children in public schools all over the New York City. Furthermore, Telemundo T.V. came and recorded the event for Spanish T.V. which will be aired in a few weeks on cable. All of the coaches and a few fencing students with parents came by to be part of the happenings. Mr. Jim O’Niell, President of Sports and Arts in Schools Foundation was also on hand to stress the importance of after school programs to the Councilman. 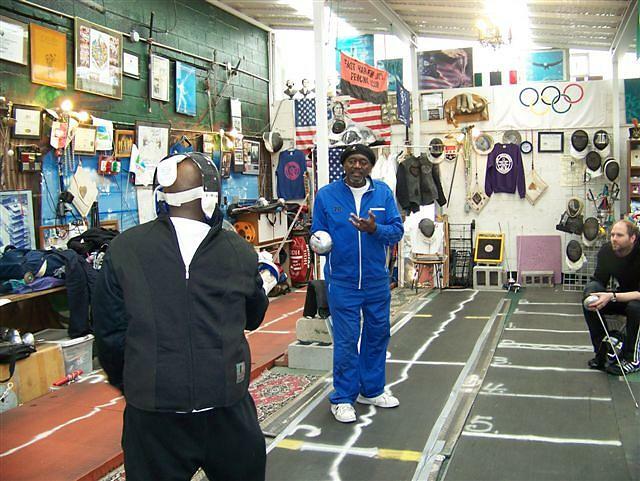 SASF gives Woodside Fencing the opportunity to reach out to the schools and provide fencing instructions. After all formalities were over Coach Fach resumed the afternoon session where coaches practiced the morning drills and got hands on experience. At the end of the first session a competitive video was shown demonstrating how and when the moves are made in competitive real time. movement. All different attacks and defense were shown and practiced. Coach St. Clair Clement also covered the bind that he learned in Germany from Maestro Angelini an Italian fencing master. Toward the end we had an intense question and answer session covering how all of the fencing moves can be used in real fencing time. 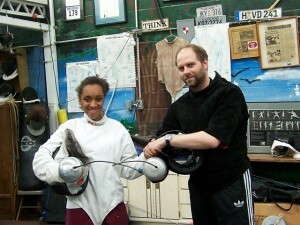 We thanked Coach Christian Fach and his student Jasmin Aron for presenting to us the German approach to teach fencing. was also kind to leave books at WFC to pass along for coaches and students. 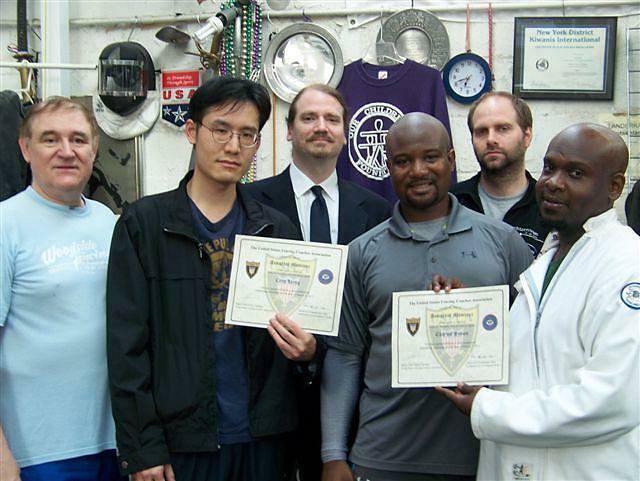 Coach Moses Sistrunk, Jr. an Assistant Moniteur passed his Foil Moniteur. 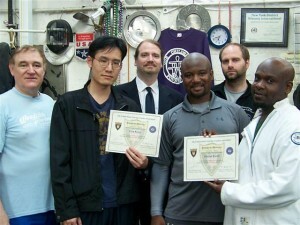 Coach Greg Rupp passed his Saber Moniteur. Coach Jack Van Nostrand passed his Assistant Moniteur. WFC thanks our examiners for the time they spent in providing their expertise. 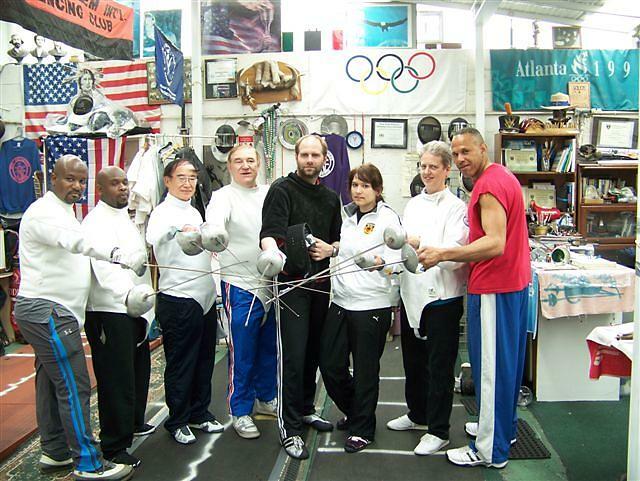 German team from Friedrichshafen, Germany and Woodside Fencing Center.